The year in footwear (so far) has brought some pretty amazing designer sneakers for men. Its no wonder the red carpet is seeing more suits paired with high tops over the traditional black dress shoe. 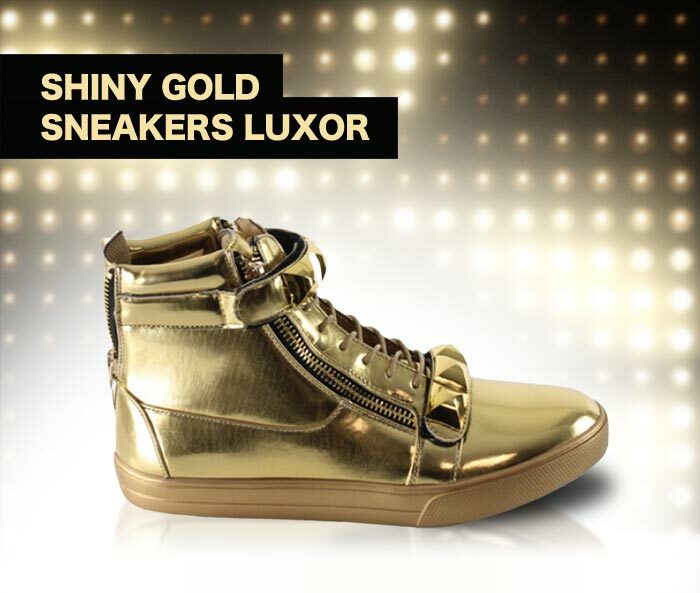 The trend is all about getting noticed in sneakers with excessive amounts of dimension and shine. From Glimms to Rick Owens, designer brands are kicking it up a notch with sneakers that look like they’re already light years ahead of menswear. Even if you’re not a self-proclaimed sneakerhead, saving up for a decent pair of kicks is worth the investment. We’ve compiled the most stylish trends and finds of this year’s designer sneakers for men that are spreading like wildfire. The future is looking bright for men’s sneakers. Although the 90s made a huge comeback, the trends are going back to the future with the Space Age theme. Designers, like Maison Margiela and Balmain, are creating quilted and padded sneakers with an iridescent glow. These shoes are constructed with an ultramodern closure swapping the traditional lace design for zippers. This footwear could be easily mistaken for sophisticated astronaut kicks. What do you get when you combine athleisure with luxury? Designer gold sneakers. Men are invading street style with highly reflective footwear in the most exquisite shade. Designer sneakers for men are looking as luxe as fine jewelry, and designers aren’t shy with it, either. You may have seen the understated version with gold accents on zippers or straps. However, this trend is taking it to the extreme with a blast of all-over color, like Giuseppe Zanotti’s leather low-top. Even Nike dropped Air Force 1’s in gold as a tribute to the summer Olympics in Rio. If you love leather sneakers, you probably already own a pair of shiny leather sneakers. There’s something timeless about patent leather that could surpass even the short life cycle of trends. Although matte leather sneakers are a style staple, patent leather sneakers are just as versatile. This glossy look is an easy way to add an extra pop to a neutral shoe without being too flashy. Designers have managed to kick this trend up a notch by making matte leather look remarkably shiny, like Balenciaga’s “shiny effect” collection. These designer sneakers for men truly make fashion an art form. The geometric trend sheds a stylish light on rubber soles that normally wouldn’t be in the sneaker spotlight. High fashion designers, like Cinzia Araia and Rick Owens, are creating sneaker soles with prismatic and sharp dimensions. Men aren’t afraid to rock ultra chunky sneakers with a little height. Not only beautiful in design, your feet will thank you for wearing a sneaker with a comfortable platform. Calf hair is the new leather. This is one of those footwear trends that make any item look luxurious for its unique texture between fur and suede. Also commonly known as “pony hair”, calf hair sneakers are basically a hairier version of leather sneakers (no ponies were harmed). These sneakers are versatile enough for men that like to dress stylish classy or funky urban. DSquared2 dropped calf hair high tops in leopard print, while Saint Laurent’s all-black low tops are the perfect suit pairing.